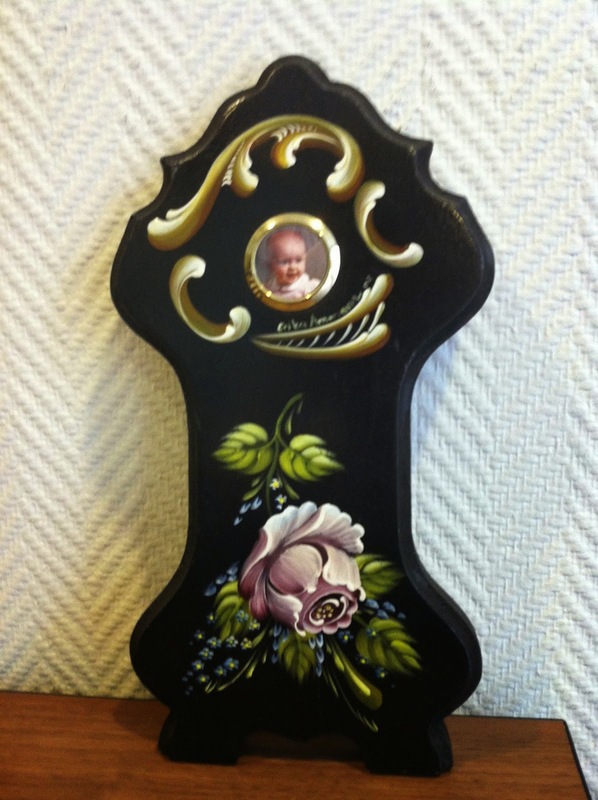 The Decorative Folk Artist | Kim - splash it! So much for modern technology. The Mac is great for the on-screen stuff, and printing, and efficiency, and all that. But like anything with character and soul it has to be hand done, with flaws and smudges and wobbly bits. And that’s the difference between a typewriter, and a PC and printer. 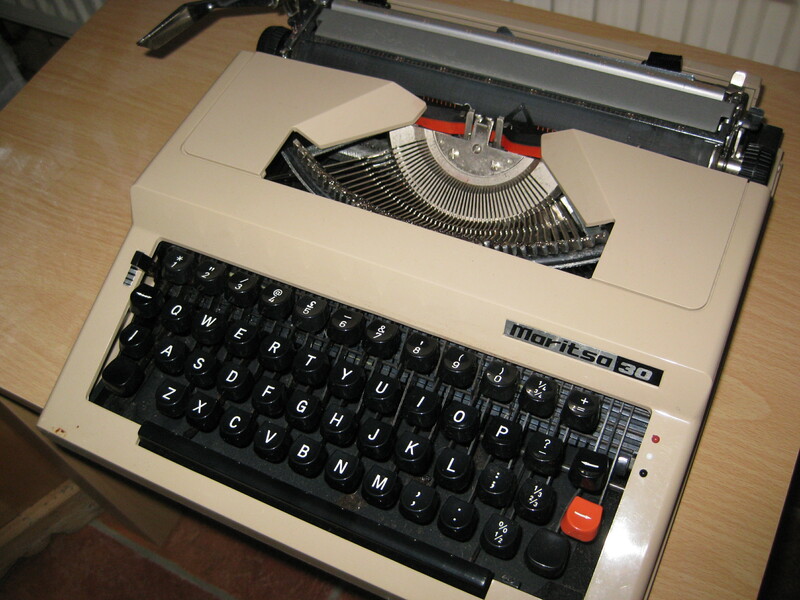 Here we have a Maritsa 30, made in Plovdiv, Bulgaria in the 1970s, possibly a copy of a Japanese Silver-Seiko design. Everything seems to be in working order, so soon words of wisdom will be flowing through the keys again. I doubt I shall produce reams of literature on the Maritsa, but it will certainly be great for journalling with the mixed media projects. For more information the Oz Typewriter blog seems a good place to start. Now where’s the Tippex and carbon paper … ? The run up to Christmas seems be going faster than ever, this year! I haven’t got any presents sorted out, all my organisation has gone to pot! I’m putting the finishing touches to the next newsletter, as well as trying to be useful in the arrangements for next year’s BADFA convention. The convention will be at Lydiard House Conference Centre near Swindon. it is a beautiful listed building set in park land. An ideal place to be inspired. It will be on the weekend of 23/24 May. Full details will be in the newsletter. I might even put forward a project for the members’ delectation! This edition of the newsletter will be in a different format. I will be using Joomag’s publishing site which should give the readers a better ‘page turning’ experience. More to follow – but I must get Christmas sorted! August 1972, where was I? Oh, yes … let’s move on. Fast forward to September 2014 – The Decorative Folk Artist, Summer edition, has just been published. All you BADFA members, check your inboxes. It seems strange to be including Christmas projects, but by the time the next edition goes out it will almost be too late. Other news is that I am offering my services as artist/instructor again (after many, many years) to encourage others to take on the teaching of decorative arts. 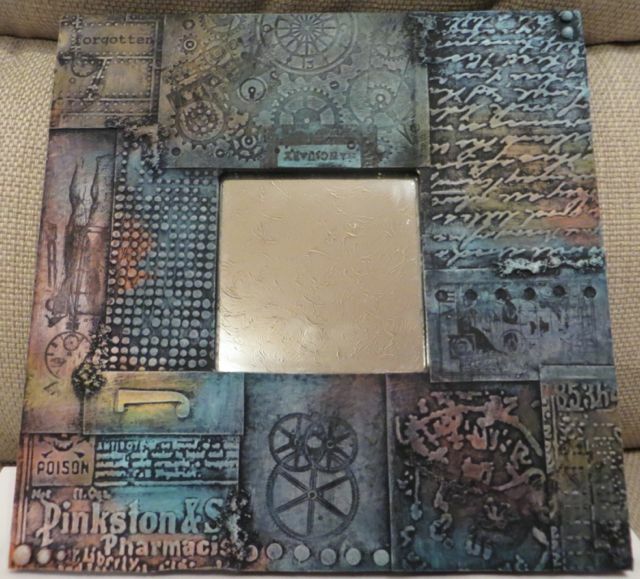 And, I am pleased to have been accepted as a member of the DecoArt Helping Artist Program (see side bar for link). More news to get our teachers out there is in the newsletter – join BADFA and get your issue! I am starting the autumn edition of BADFA’s members’ newsletter, so this is a gentle reminder to those who are preparing to submit an article. Closing date for submissions is 15 October. I would rather have plain text in the body of an email with your pictures as attachments, than formatted Word documents. I am happy to receive complete projects, techniques ideas and suggestions and useful tips. You don’t have to worry about spelling or grammar, punctuation or layout – I will sort that before publication. So there is no excuse – get brush to canvas, and pen to paper. If you need the email address, leave me a comment and I’ll send it. On Saturday Julie and I went back to The Stamp Attic in Wantage for another day’s colour and experimentation with Andy Skinner. Oddly enough we didn’t know what to expect and, for technical reasons, Andy had changed his planned day for something a little different. 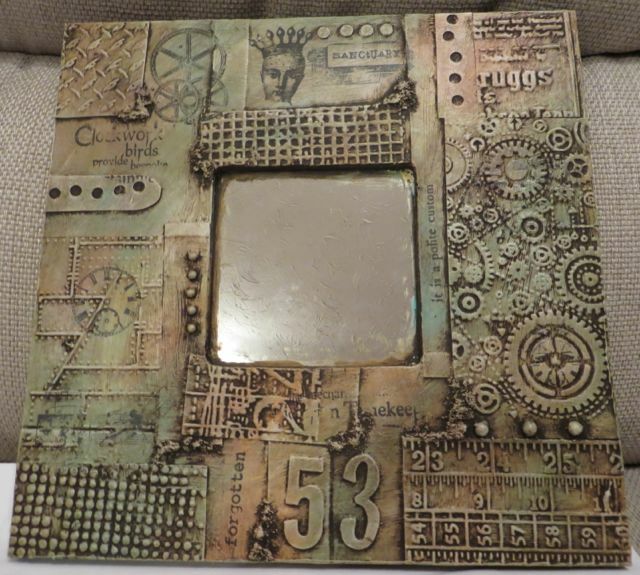 It was a day of mixed media; a cheap mirror, heavy weight art card, glue, gesso, texture medium, colours, stamps, a fascinating piece of machinery, and a secret ingredient. Here are our final results. Julie finished hers with Payne’s Grey, and I used Burnt Umber. We both started with the same basic colours, but the end results are completely different. Another fun day, and a welcome relief from the stress of moving house! Watch out for the next edition of The Decorative Folk Artist for more ideas and techniques. Next edition is early November and is for BADFA members only. I’ve been slogging away at the next edition – the first since our annual convention in Swindon – and it will be sent out to our email subscribers very soon. The CD subscribers will be a few days later. There are some interesting and thought provoking articles; I tell you about my day with Andy Skinner, Gill Hobbs starts her new series of projects for beginners, and not-so-beginners, Dorothy Oliver tells us what she things of the BADFA collection, and Ann Patmore describes her time spend with one of our popular teachers. So, if you are a member of BADFA, the Summer edition will soon be with you. If you are not a member of BADFA, then you should be. Don’t forget to drift by our web site to keep up to date with the latest goings-on! www.badfa.org incase you were wondering.